A newly-discovered spacies of rust-eating bacteria will have consumed the wreck of the Titanic within 20 years. There's a conspiracy theory saying the Titanic never sunk. Instead, it was her sister ship, the Olympic, and it was an insurance scam. In 1898, 14 years before Titanic sank, author Morgan Robertson wrote a book about an "unsinkable" ship called the "Titanic" that crashed into an iceberg and sank. A priest on the Titanic refused to board a lifeboat twice. Instead, he stayed behind to hear confessions and give absolution to the people left on the ship. A man who survived the sinking of a ship in 1871 was finally able to overcome his fears and decided to sail again in 1912: he died in the sinking of the Titanic. After the Titanic sank,the Families of the band members were billed By white star Line for the cost of the uniforms worn as the band members died. Kim II-Sung, founder of North Korea, was born on the day the Titanic Sank. It took 73 years to find the wreck of the Titanic. Kate Winsle, who played in the movie "Titanic," hated the song "My Heart Will Go On", and said it makes her feel "like throwing up". Ships today are more likely to encounter an iceberg than the Titanic was. The Iceberg that sank the Titanic began its journey somewhere around 1000 BCE. 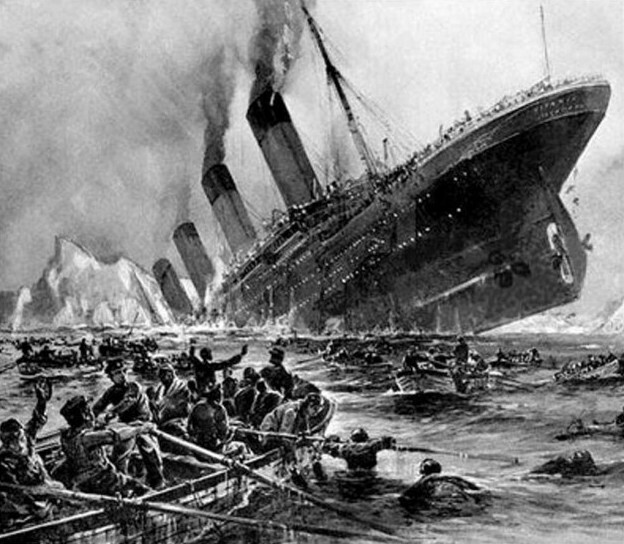 Not a single engineer, out of the 30, made it off the Titanic: they stayed and kept the power on so others could escape. 53% of the people on the Titanic could have survived using the lifeboats. Only 31% did. Nearly a dozen couples were celebrating their honeymoon on The Titanic. The Most expensive first class suites in the Titanic were to have cost up to ?870 (?75,156 today). The Japanese who survived the Titanic crash was called a crowd in his country for not dying with the other passengers. The Titanic's fourth funnel was fake. It was added to make the ship look more powerful and symmetrical. Four forward compartments could flood without risk of the Titanic sinking, Six did. Titanic is the only ocean liner to ever be sunk by an iceberg. Choclate magnate Milton Hershey canceled his reservations for the Titanic due to last minute business matters. The Titanic could have been saved if it was not for a 30-second delay in giving the order to change course after spotting the iceberg. Most lifeboats launched off the Titanic were not filled to capacity. The Titanic's chief baker "fortified"
the Titanic kept playing music for hours as the ship sank. The New York Times wrote an article about every single "9/11" victim. Al-Qaeda initially considered targeting nuclear power plants on 9/11 but decided against it, fearing things could "get out of control". meeting at the WTC on 9/11 but overslept. The 9/11 attacks also destroyed US$100 million in art including work from pablo picasso. but came 10 minutes late. Qatar's 2022 World cup will take more lives than 9/11 due to horrible working conditionsfor migrant workers building stadiums and infrastructure.